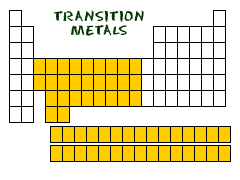 The 38 elements in groups 3 through 12 of the periodic table are called "transition metals". As with all metals, the transition elements are both ductile and malleable, and conduct electricity and heat. The interesting thing about transition metals is that their valence electrons, or the electrons they use to combine with other elements, are present in more than one shell. This is the reason why they often exhibit several common oxidation states. There are three noteworthy elements in the transition metals family. These elements are iron, cobalt, and nickel, and they are the only elements known to produce a magnetic field. The transition metals are the metallic elements that serve as a bridge, or transition, between the two sides of the table. The lanthanides and the actinides at the bottom of the table are sometimes known as the inner transition metals because they have atomic numbers that fall between the first and second elements in the last two rows of the transition metals. Zirconium is the first of the transition metals, their very existence being a practical reminder that metals are crystaline in essence - and nothing more so than zirconium, which is manufactured to produce the beautiful artificial cubic zirconia diamonds. Light and strong, lustrous and exceptionally resistant to corrosion, zirconium dances between the planes and keeps its identity regardless of the states it inhabits. Magically, this makes it into a good companion for far journeys, and transmutation. Titanium is a light, strong metal with low density which seems at home most in an oxygen free environment - space metal, in other words. Use for meditations, explorations and invocations of stellar entities, and interstellar communication. Chromium is primarily a catalyst that helps lift us up and out of ordinary places and into the extraordinary. Both radiant and reflective, it can be used as a portal for extradimensional travel. Tungsten is a strong and powerful protector, highly resistant to heat and other forms of radiation. It has a core quality of strength in structure in difficult environments, including extraterrestrial environments. Manganese has interesting effects on its environment and belongs to the group of metals used in shape shifting. Because of its ability to both deflect and refract light and energy, it is a flexible shield maker and strengthener, an ally to the traveller. Cobalt takes the refraction properties of manganese one step further and produces very specific, deeply hypnotic emanations that can both cloak and transform the traveller. Radiant, powerful and extremely psychically active. Gold is the sun metal. It has therefore been linked over the millennia with everything to do with health, wealth, and growth. On another level, it is about slow flow towards accomplishment. When working with gold, bear in mind that most things sold as gold these days are alloys. 24k gold is pure gold only. Silver is a high level conductor, an open river that carries all things both ways. Silver absorbs many things but it doesn't store them which makes it into a very good metal for magical charms that need to flow and work on a continuous basis and without needing to be cleaned in between. Silver is also magically neutral. Platinum has been called the "solid wisdom metal". It has a time attribute similar to lead which gives it extra dimensionality and a viewpoint of the wisdom of hindsight (or foresight). Platinum is an excellent metal for soul meditations and to help find and keep on a true road in this lifetime. Ruthenium is an interesting metal which in and of itself isn't that strong, but lends strength when added to gold or platinum. For energy magic, Ruthenium can be a good choice when we need a catalyst to lift existing strengths and qualities to the next level. Rhodium is the metal of achievement beyond earthly wealth, power and respect. Meditations and potions invoking rhodium have the power to move the world in a very different way. Palladium is the metal of guardianship on the highest levels. Not a protector or a teacher, but a stable champion and a friend to keep grounded even when travelling very far from home. Osmium is the metal of endurance beyond reason and strength beyond expectation. Adding the essence of osmium to a potion will evoke the vast reserves of strength which lie within each of us, but which we rarely reach or tap. Iridium is the crucible metal and it is all about staying true to oneself in changing circumstances or even in hell itself. Iridium is helpful when absolute resolve is required; and through this resolve remaining steady, the environment becomes changed instead. A great seed component of energy magic potions that require a miracle to bring about the desired outcome.